(19) I am lucky that I live in a city that does not require sorting of recycled material. However, for those that have to sort their recyclables, it can become a chore and take up space. 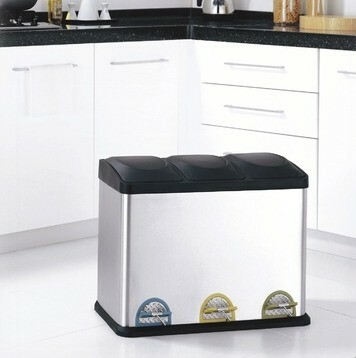 This cool Three Compartment Step-On Recycling Bin ($146.00, on sale for $102.56) keeps paper, plastic, and aluminum organized using three separate sections with color coded pedals. Each section has its own removable plastic liner with handles making removal and cleanup easy. Thank you so much for stopping by The Mindful Shopper! I hope you enjoyed my post all about fun gear to help you get organized in the kitchen!